Want to batch modify components? Can’t identify the corresponding relationship between component pins and footprint pins? Don’t worry, EasyEDA can do this. 1. Footprint manager will check your parts package correct or not automatically. If the part without the package or this package doesn’t exist in EasyEDA Libraries, or if the part’s Pins doesn’t correspond the package’s Pads correctly, the footprint manager will show the red alert. method 1: change part’s pin number to A and C.
method 2: change package’s pad number as 1 and 2. That needs the package is created by you. And you can’t change the Pad number in footprint manager, you need to find out the package at “Libraries > PCB Libs > Personal”, and then edit it. method 3: find an other package and update. 2. In the preview area, you can zoom in, zoom out and pan with mouse. 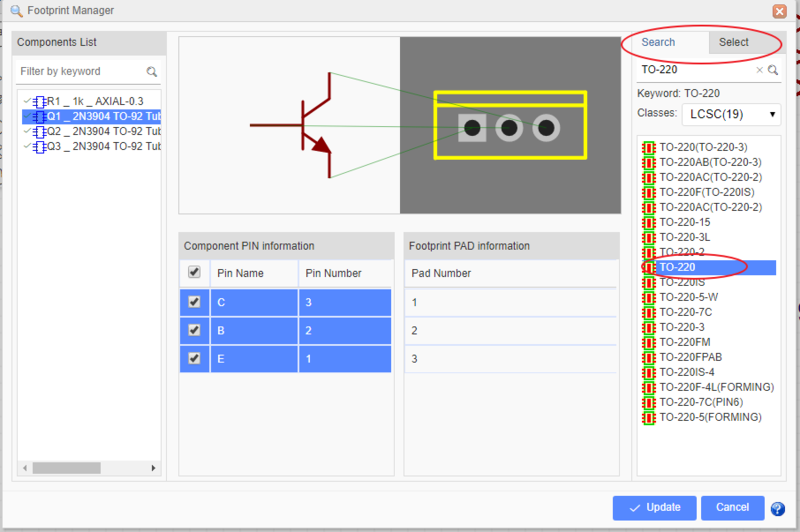 Component PIN Information: And you can modify component’s pin map information in here. 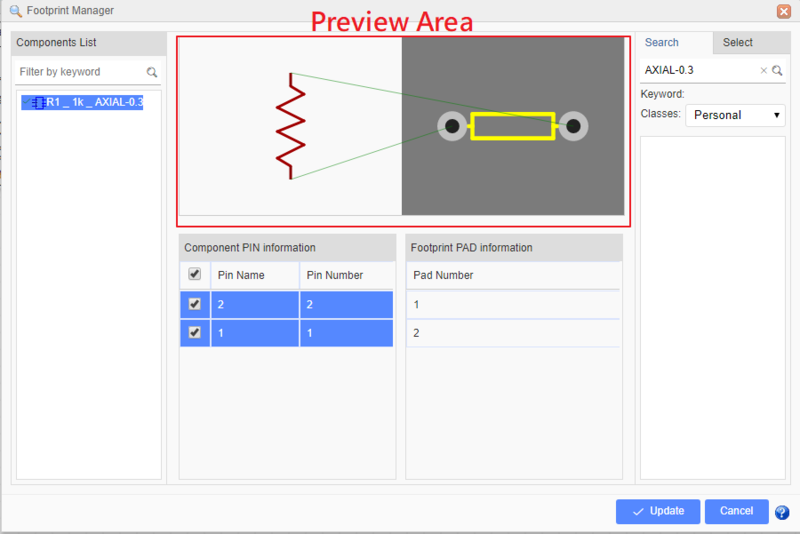 PCB PAD Information:You can check the footprint’s pad number, but you can’t modify it. 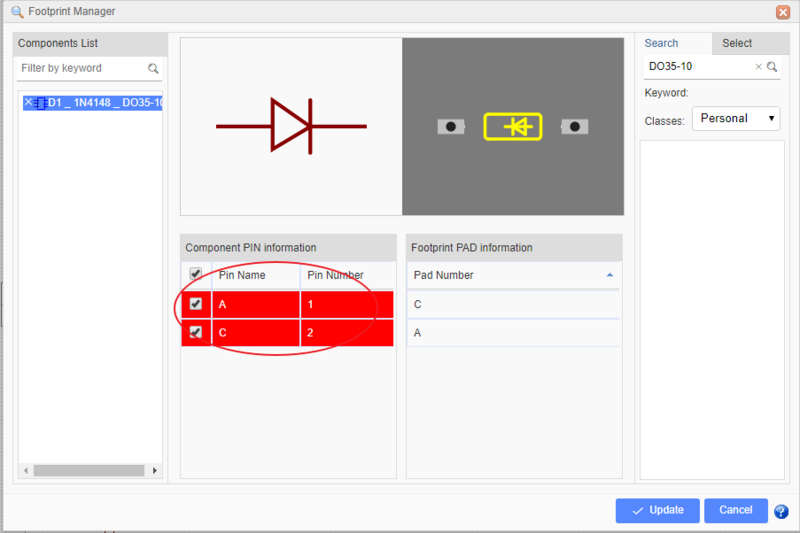 when you select the component on the left side, it shows component’s package pad number, if you selected a package which is searched or selected from the classes, it will show the selected package’s pad number. 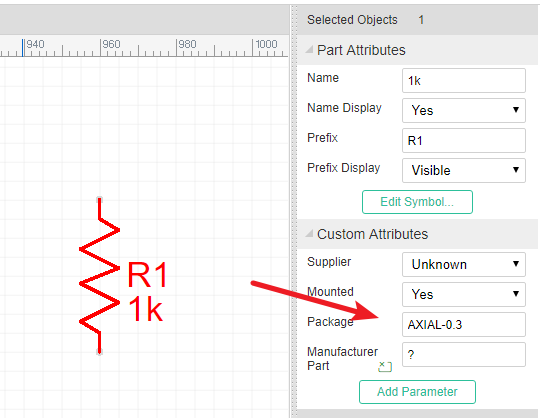 If you want to change the Package, for example, select a component such as Q1, from TO-92 TO TO220, you just need to click in the package input box. 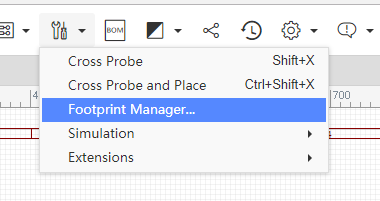 EasyEDA will popup the footprint manager dialog. You can follow the instructions. After that you will find you have changed the package to TO220. To ensure that you use a package type that is already in the EasyEDA libraries, it is recommended that you use this technique to change component packages rather than just typing a package directly into the package text box, otherwise, you can’t use the Update from Libraries and Import Changes function in the PCB, because of the footprint manager will add the package’s global unique ID into the schematic when the package updating. When you select a subpart, the others subparts will be selected too, so they will update the package together. If you want to batch modify components’ packages, in the footprint manager dialog you can press CTRL + click or SHIFT + select to select the components, and then select the package to update. To use your own packages, you can select Personal on Pattern Libraries area under the Select tab.